Evangelicalism has tended towards one of two extremes with regard to the issue of divorce: (1) either broad allowance of all divorces, or (2) a rejection of all grounds for divorce – even Biblical ones. 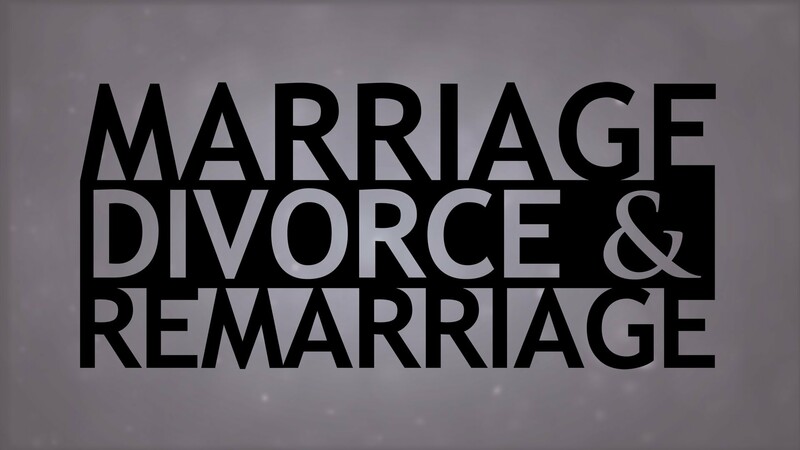 In our current cultural climate marital problems have become increasingly pronounced and many more are wondering, what does the Bible actually say about divorce. It is worth the effort, then, to clarify the Bible’s precise position on the subject. The Bible’s theology of divorce begins in the Old Testament, which sets an important context and framework for later pronouncements. Marriage was created by God and His Word explains and explores what it means to be married. As early as Genesis 2:24 God establishes the covenant bond of marriage between one man and one woman, each who leave their families of origin and start a new family. The ideal was that this new family would live “happily ever-after,” but in a post-fallen world marriages are as broken as the rest of life. One particular manifestation of this is divorce. Immediately after the Fall of Adam and Eve, God recognizes that marital conflict will become a reality in this world, see Genesis 3:16. The Bible recognizes the reality of divorce. The Bible is not naïve about the brokenness of marriage. In Deuteronomy 24:1, we read Moses’ command that any man who divorces his wife must write her a certificate of divorce. The certificate was intended to legally declare the dissolution of a marriage and to offer protection for the woman. In ancient cultures, women were often treated as property, and while a man may divorce a woman and marry another, he could come back at any time and claim rights over the previously divorced wife if he so chose. The certificate of divorce meant this woman could remarry without fear of her former husband returning to claim her again. Without this she had no hope of convincing another man to marry her. (See David Instone-Brewer, “Deuteronomy 24:1-4 and the Origin of the Jewish Divorce Certificate.” Journal of Jewish Studies. 49. 1998. 230-43. )The certificate did not make a couple divorced; it simply recognized what was already a reality. Papers, court cases, and judicial rulings do not end marriages. Broken marriages are a result of broken vows. The Bible acknowledges this aspect of the fallenness of our world and offers grace and mercy to the victim of these broken vows. 10 If he takes another wife to himself, he shall not diminish her food, her clothing, or her marital rights. 11 And if he does not do these three things for her, she shall go out for nothing, without payment of money. The text explains that if a man marries a second woman, he is not permitted to deprive his first wife of what she needs. In this text, the focus is on food, clothing, and conjugal rights. If he doesn’t do this, the law permits her to divorce her husband and receive appropriate compensation from him for her livelihood. The neglect of these particular rights constituted grounds for divorce according to the Old Testament. These case laws, then, though arising out of unique situations have an element of universal application. What was true for the rights, freedoms, and protections of the slave woman were equally true for the full-fledged member of the people of Israel. A principle for one woman in one context becomes the principle for all women in Israel’s community. The Old Testament presents then three grounds for divorce: neglect of material support (food and clothing), neglect of physical affection (conjugal rights), and adultery. These were represented in the Jewish wedding ceremony by the vows that a husband and wife would make to each other. In ancient marriages, as in modern ones, husbands and wives commit to protection, provision, and faithfulness. It is vital that we understand the Old Testament laws offered grace to those who were the victims of broken vows. You could not, under the Mosaic law, divorce your spouse for any reason. Divorce was only available to those who were victims of the broken vows. We will see how this changed within Jesus’ day, and how Jesus offered a corrective to that developed practice. Summary: The Old Testament recognizes that marriages within the fallen world are imperfect, and some will experience that imperfection through the violation of covenant vows. In such cases God provided, as a means of grace to the victims of the broken vows, the option of divorce.